A few months ago, I did a Minimalism Challenge with a group of friends. It was a great way to stay on top of doing a little each day and making forward progress with small blocks of time. It also highlighted a few of my own weaknesses when it comes to many goal-oriented projects and tasks. The big (oh-so-obvious) discovery: Lack of thorough planning ahead derails momentum. One afternoon, I was in a mad rush to get my house picked up and food made before some friends arrived for dinner. I’d had a great day: I got some solid work time in, had a fantastic inside picnic with my preschooler and did some fun outside play with both boys, and had adequate time left for cooking and a quick clean. If that was the end of the story, I could bill myself as the poster-child for Rockstar Work-at-Home Mom. And who doesn’t want that? What I hadn’t done was my Minimalism Challenge for the day. I had been meaning to go through and delete a ton of photos from the phone, but hadn’t had a chance to verify that they’ve all made it to the computer. I didn’t have time to do it right then (See: “mad rush to cook and clean”). By the time everyone left and the kids were in bed, I had forgotten all about clearing space on my phone to take a picture. Did I mention that my interim solution was to hide the items in our pantry so people wouldn’t see them sitting out and ask me why I had random items on the counter? Yeah, I’m crafty like that. And that’s the only definition of the word “crafty” that will ever apply to me. Goal for the day missed. And double burden for tomorrow. Have you found yourself in a similar situation? What is holding you back from reaching your goals is often a small piece of the puzzle. Unfortunately, this small piece of the puzzle is a momentum killer when not planned and accounted for. BJ Fogg, the creator of Tiny Habits, advocates breaking things down into bite-sized goals, particularly focused on the one first step. For example, if your ultimate goal is to floss your teeth, start by making a goal to set the floss out on the counter every day. 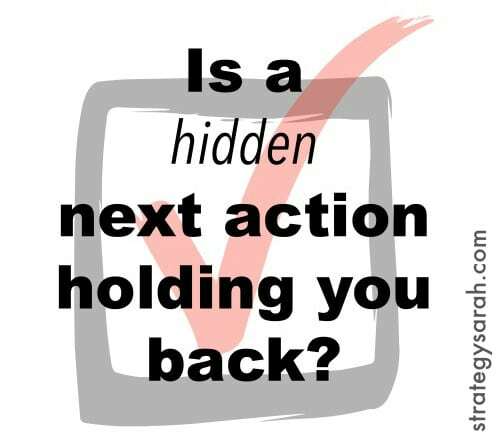 Similarly, I would advocate that there are often “hidden” steps in our projects – those steps that we don’t consciously think about, but are prerequisites to our identified next action. Think about a goal or project you’re currently working on. What is the next action that needs to be taken to achieve that goal? Do you need to do anything else to make that next action possible? If so, that’s a hidden step along the way. Subtle, but I hadn’t accounted for the hidden next action and it killed my momentum. What is killing your momentum today? Can you identify any hidden next actions? 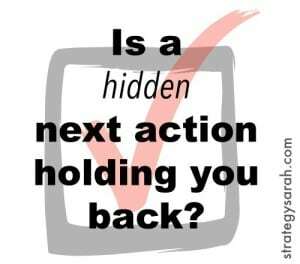 What one small action can you take today to reduce or eliminate the hidden next action barrier? Released in 2015, The Fringe Hours* by Jessica Turner is a refreshing quick read. Jessica takes a no-nonsense approach with the mentality that of course you should take care of yourself. She also advocates that there is plenty of time in the day for all of us to practice self-care – in the fringe hours. 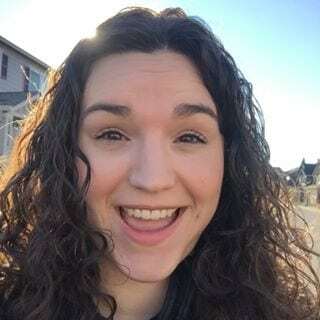 As someone who has spent way too much time dwelling on whether or not I’m being selfish with my need for space and alone time and hobbies, I needed to hear the message Jessica shares. Somehow she managed to say what I’ve felt but couldn’t manage to put words to. Yes, it is important to take care of ourselves so that we can live take care of others. And we have the time to do so – even if some of us have to be more creative to find that time. I’m still learning to prioritize what recharges me, especially when that isn’t something I can quantify as productive. One of my favorite examples of prioritizing time was that of doing a craft project while laundry was piled up and the dishes weren’t done. In my own life, keeping chores done enough, but not perfect, is one of the only ways to get the time I need for activities that re-charge me. A great tip for extra reading time: read a magazine while drying your hair. I’ve read while drying my hair for years, although I usually read books rather than magazines. Kindle books are super easy to read. If you’re reading a print book it can get a little tricky to find weighted items to hold down the sides of the pages in order to read hands-free. I highly recommend you grab a copy and read it in your #FringeHours! Check out more good reads here. *Disclaimer: Yes, this is an affiliate link. I also received a complimentary (that’s free) advanced readers copy of the book in exchange for an honest review. All thoughts and opinions are my own. I would gladly pay full price for this book.